It’s safe to say that birds are pretty unique animals. But what exactly is it that makes them unique, aside from the obvious traits like the ability to fly? As it turns out, there are a number of traits that are possessed only by birds, or more common traits that birds have developed to a much higher degree than other animal groups. Birds are bipedal vertebrates, which means they are two-legged animals which possess a backbone. In this way they are similar to humans, but that is where the similarities end. Birds are distinguished from all other vertebrates by the presence of feathers. Feathers are simply modifications of the outer skin, however, they are highly unique modifications that are possessed by no other creatures. Feathers are lightweight, flexible structures that have two main uses: body temperature regulation and flight. All birds have bills. Their bill varies greatly in both form and function across the entire spectrum of bird types but they have two common characteristics: they are always toothless and they are covered with a horny sheath. Bird bills have no equivalent structure among other vertebrates. The only close approximation is the snout of the Duck-billed Platypus, which is itself a very unusual mammal found only in Australia. Birds have wings, a trait which is not unique to birds as both bats and insects also have wings. However, it could be argued that birds are, by far, the best animal aviators. This is likely due to the fact that the entire body of a bird is structured for flight. Bird bones are lightweight due to their being either hollow, internally-strutted or spongy. Bird skeletons are structurally reinforced for the rigors of flight, through the fusion of several sets of bones in their hands, head, pelvis and feet. The walls of their thorax (chest) have been strengthened by small protrusions on their ribs, called ulcinate processes, which curve backwards and overlap with other ribs. The furcula (aka, the wishbone) moves slightly during flight, compressing and rebounding in response to the beat of the wings, thereby acting as a spring and increasing the power of the wingbeats. The outer bones of the wings are actually fused hand bones, whose sole purpose is to support the large primary flight feathers and maneuver the end of the wing. To aid their ability to fly, birds have a powerful four-chambered heart and very efficient, flow-through lungs. Both of these modified organs are required to cope with the high energy demands of flying. Bird muscles are composed of dense red fibers which are capable of maintaining a very high, sustained workload. This allows birds to fly long distances. 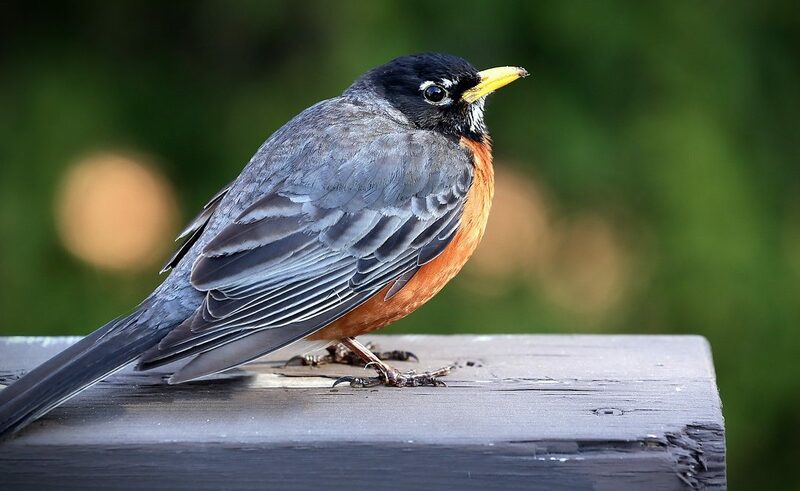 These same muscles are also capable of generating body heat through shivering, which allows birds to maintain a very high body temperature 104ºF to 111ºF (40ºC to 44ºC) regardless of the surrounding air temperature. Birds possess a counter-current heat exchange system in their legs. This means that the arteries and veins in the legs are located adjacent to each other. As warm blood passes along the arteries towards the feet, the heat in the blood is transferred to the colder blood which is returning to the heart through the vein. The result is that very little body heat is transferred to the feet. Bird feet are covered in scales and are generally bare of feathers. The scales protect the legs and feet, and the lack of warm blood moving through the feet means that not only does the bird conserve its body heat, but they can also stand on cold surfaces (i.e., ice, frozen metal) without their feet freezing to that surface. Birds have an unusual reproductive system; they produce large, internal eggs which are richly provisioned and then layed externally. They also display dedicated parental care in protecting and incubating the eggs, and then caring for the young after they hatch. Mating systems among birds are complex and varied. Some species form monogamous pair bonds that last for life. Others form monogamous pair binds which last only a single breeding season. And still other species employ mating systems which include polygyny (one male mating with more than one female) or polyandry (one female mating with more than one male). Birds have well developed brains and are capable of learning complex tasks. This high level of intelligence also allows birds to undertake complex social behaviors and produce an amazing variety of vocalizations. Birds have highly developed neural systems, allowing them to perform astounding feats we would not normally associate with animals. This includes the ability to navigate using the Earth’s magnetic field and the sky’s star patterns, such that a warbler which weighs les than a silver dollar can migrate thousands of miles across unfamiliar terrain yet return to the exact same nest site the year after year. This is just a brief review of the incredible attributes that characterize the average bird. Read on through the rest of this website for more information on just what it is that makes birds so amazing.